I first read The Hobbit in college. I was fresh off my foray into the Harry Potter series, which taught me that fantasy wasn't always awful and that I needn't avoid it. 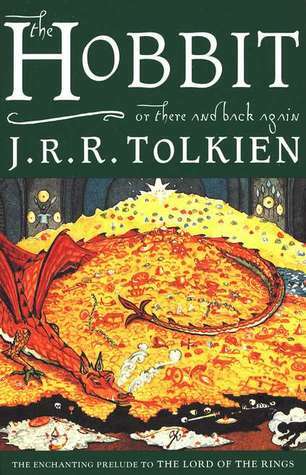 If you want to break into the fantasy genre, what better place to start with The Hobbit? My memory of what I thought of the book at the time is pretty fuzzy. I know I gave it a 3 star review on Goodreads. I basically remember liking it well enough but not being overly impressed. Fast forward ten years and I decided to read The Hobbit again as part of a Lord of the Rings read-along. I'm better versed in the high fantasy genre now and The Hobbit didn't feel so foreign. This time, I loved it! My initial impression is that The Hobbit feels like a lot of other books that I've read. Tolkien did not invent the hero's journey theme nor was he the last to use it. It's a basic framework that is repeated again and again. It made the book feel simpler, like the children's novel that it is. That's not to say the story doesn't have its complexities of character or plot. Rather, the familiar framework was comfortable - like meeting an old friend. The Hobbit is a book meant for children but is appropriate for all ages. It has that wonderful fairy-tale speak that the best children's novels do. It's the perfect blend of word choice and style that enthralls young readers yet doesn't talk down to them. It also makes the book feel timeless. The characters, of course, are wonderful. Bilbo is the classic normal guy stuck in a weird situation. He reminded me of Arthur Dent in Hitchhiker's Guide to the Galaxy or Richard in Neverwhere or even Harry Potter: Someone who is unwittingly brought along for the ride and ends up being a crucial part. Bilbo is a cheerful sort, although he spends much of the book being grumpy. He's flexible enough to adapt to the extraordinary situation he finds himself in, yet his obstinacy is what often saves the day. He is both fair and cunning. I enjoyed the other characters as well. Gandalf is presented as a god-like figure, but it's also indicated that he makes mistakes. We only scratch the surface of his personality, but there's enough to know that a three-dimensional person lies beneath. I particularly found Thorin and the other dwarves intriguing. They are a bit arrogant towards Bilbo at first, but they soon warm to him as he proves himself useful. As the book goes on, I saw them as brave comrades in arms fighting alongside Bilbo. But what I really liked was how layered they became at the end. They were all brave creatures, but they were also greedy and stubborn and it nearly did them in. I do have a few criticisms of the plot. Mostly towards the end. The ending of Smaug was anti-climactic. Smaug was set up as this huge foe to be conquered, but it was dealt with too quickly and wasn't nearly interesting enough. Similarly the Battle of the Five Armies came out of the blue. Not only was there inadequate set-up, but it was over with really fast. This could have taken up a large portion of the book with all the different players and the consequences. I suppose Tolkien didn't want to get bogged down in a big war for a children's book. And then of course there's the Ring. The discovery of the ring and Gollum is one of the only parts of the book I remembered. I didn't even remember that it made Bilbo invisible. It is probably my favorite part of the book and, I think, one of the most memorable events in all of modern literature. I am so glad that I re-read The Hobbit. It goes to show that one's feelings about a book can vary drastically depending on when you read it. I finally feel like a legit fantasy fan, because I was able to lose myself in Tolkien's world. Onto The Fellowship of the Ring now! One of my all time favourite books but it does annoy me a little in parts. As you say Smaug's end is very unsatisfactory but it always bugs me that Tolkien didn't feel the need to balance his books out with female characters. The Hobbit is the worst offender for this as there are basically no female characters at all, hence the new movie's addition of Tauriel who they made up just for the film (at least TLOTR had Eowyn - and Arwen to a degree). It's for kids but I remember as a kid that while I loved it I found it hard to relate to completely as their were no girls in it and it obviously still bugs me a bit today! Still a fantastic book though regardless, got to love that Gollum! It's been way too long since I read this book. I think I'm due for a reread. I would love to pick up this book and read it. I'm a big fan of the movies so I'm sure I would love the book as well.